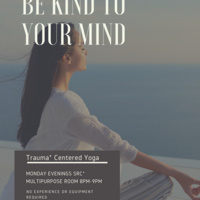 Trauma Centered Yoga is free and open to all members of the Goucher community. This is a gentle style yoga class. Trauma is not discussed. Trauma can be anything from grief to cancer, to sexual assault; yoga has been shown to help people dealing with difficult circumstances.